The Emory Big Band performs for Jazz Fest on Saturday, Feb. 9, closing out this year’s Founders Week celebration. Emory will honor its historic beginnings and vibrant contemporary role in promoting inquiry and intellectual life with Founder’s Week, a midwinter celebration filled with lectures, art, philanthropy and music. Founders Week commemorates the first meeting of the Board of Trustees on Feb. 6, 1837, following the founding of Emory College in Oxford, Georgia. The annual program highlights opportunities to participate in the rich diversity of Emory’s academic and campus life. This year’s celebration will run Feb. 3 through Feb. 9 with a series of lectures and events that spotlight issues both local and global, including topics of race and culture, art and identity, history, technology and politics. The Emory community is also encouraged to join in a range of campus activities, including the annual Bach Bowl, a Wonderful Wednesday celebration, men’s and women’s basketball games, and a Big Band jazz fest. This year, Founders Week will coincide with Emory’s All In a Day, an online day of giving that will run Feb. 6-7. With a focus on creating positive change, the event invites alumni, parents, employees, students and friends to make a difference by contributing to student scholarships, strengthening academic programs, funding transformational research, and supporting innovative patient care. All In a Day begins at 12 p.m. on Wednesday, Feb. 6, and continues for 30.6 hours — 1,836 minutes in honor of Emory’s founding year. Through a dedicated website, allin.emory.edu, donors are encouraged to help move Emory forward by directing support to any part of the university, complete with gift-matching opportunities and fundraising challenges. Last year’s event raised $1,002,251 through 3,415 gifts. The Vega Quartet collaborates with organist Timothy Albrecht for Emory’s annual Bach Bowl, which celebrates the work of Johann Sebastian Bach and concludes well before the Super Bowl kick-off. The program also features performances by Emory faculty, including tenor Bradley Howard and pianists Elena Cholakova, Don Saliers and William Ransom. Presented by the Emory Chamber Music Society of Atlanta, the concert is free with no tickets required. Regina Bradley, assistant professor of English and African Diaspora Studies at Kennesaw State University, will discuss her research into popular culture and race in a presentation that explores how Atlanta hip hop duo OutKast influences conversations about the black American South after the civil rights movement. • Founders Day Celebration, Cox Hall Bridge, 12 to 2 p.m.
Meet on the Cox Hall Bridge for an afternoon of fun, food and beverages. Kemal Kirisci, TÜSİAD senior fellow and director of the Center on the United States and Europe's Turkey Project at the Brookings Institution, will present the 2019 Turkish Lecture, sponsored by Emory’s Halle Institute for Global Research. In celebration of Emory’s Founders Week and the centennial of the Michael C. Carlos Museum, Emory University Historian Gary Hauk will give a lecture tracing the museum’s history, from Seney Hall at Oxford to its current home designed by architect Michael Graves on Emory’s historic Quadrangle. From a cabinet of curiosities, the museum has developed into one of the finest collections of antiquities in the Southeast. Co-sponsored by the Emory Libraries, the lecture is held in conjunction with the exhibition, “The Carlos as Catalyst: The Transformation of the Museum at Emory,” on view the Rose Library through May 31. Reception to follow. Emory alumni, parents, employees, students and friends are invited to make a difference through an online day of giving. The campaign begins at 12 p.m. and continues for 30.6 hours. For more information, visit here. A keynote discussion, “The Second Amendment in an Era of Mass Shootings,” will be held by Robert J. Cottrol, George Washington University School of Law, and Adam Winkler, UCLA School of Law. A panel discussion on gun-related crime and enforcement will include panelist Sally Yates, partner at King & Spalding and former U.S. Deputy Attorney General. All students, faculty and staff from throughout the Emory community — including those who work and study on the Oxford College campus — are invited to attend a public open house for the newly renovated Convocation Hall. Originally constructed in 1916 to house Emory’s school of theology, the marble building has more recently served as home to the Candler School of Theology and the Pitts Theology Library, which have been relocated to new campus buildings. Student docents will be on hand to lead tours of common spaces. Joy Buolamwini, founder of the Algorithmic Justice League and graduate researcher in the Massachusetts Institute of Technology Media Lab, will discuss harmful bias in code and artificial intelligence in her talk, “Dangers of the Coded Gaze.” Buolamwini uses art and research to illuminate the social implications of artificial intelligence. For more information or to RSVP to the event, visit here. Ghanaian-American philosopher, cultural theorist and novelist Kwame Anthony Appiah, professor of philosophy at New York University, will deliver a lecture sponsored by Emory’s departments of art history, philosophy and English, and the Laney Graduate School. 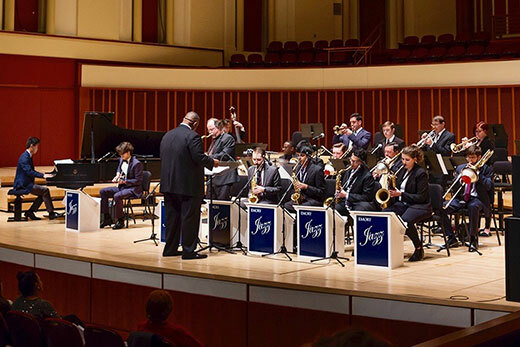 From Ellington and Basie to the works of today’s talented arrangers, the Emory Big Band showcases the best in jazz band repertoire. Tickets are required, but free and available — with a limit of four per order — by visiting here.